ProTown BMX 2019 - Saturday, March 30, 2019. N Main Street in Downtown Wendell. TWO Shows 11 AM and 2 PM. 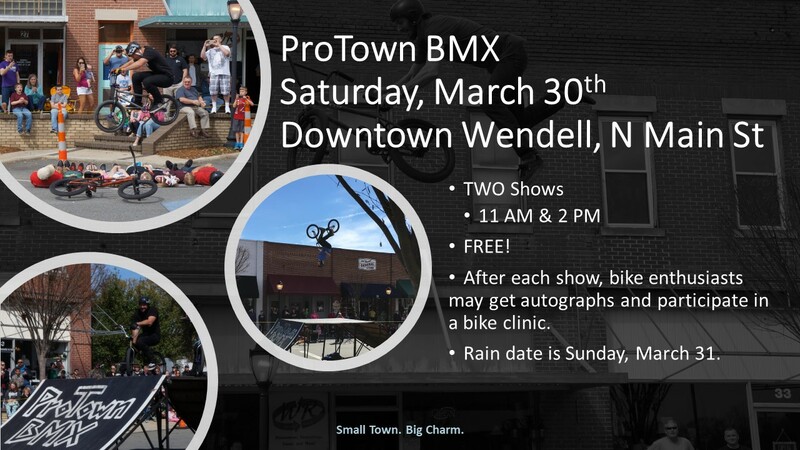 Saturday, March 30th, join us on Main Street in Downtown Wendell for ProTown BMX. Two Shows – 11 AM and 2 PM. Watch the ProTown BMX team perform gravity-defying flips, spins, whips and much more! After each awesome performance, the team will have autograph sessions and free riding clinics. Bring your bikes and helmets and ride with the pros!